Fiesta Key began as a knob of coral rock that appeared as the ocean waters dropped some 26, so years ago. It being much smaller than its neighbor just to the south, Long Key, and it was even slower in getting a name. Even after having a name, it completes with another Fiesta Key near Disney World and one near Bradenton, Florida. Simply stated, Fiesta Key is between the major Keys of Long Key and Lower Matecumbe Key which are separated by the Channel two and five bridges. 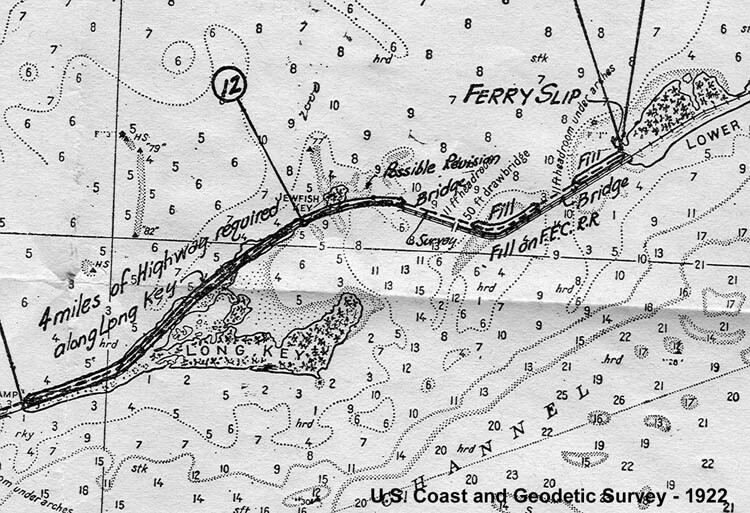 To be more specific, I copied a section of a 1966 navigation chart and inserted it to the right. 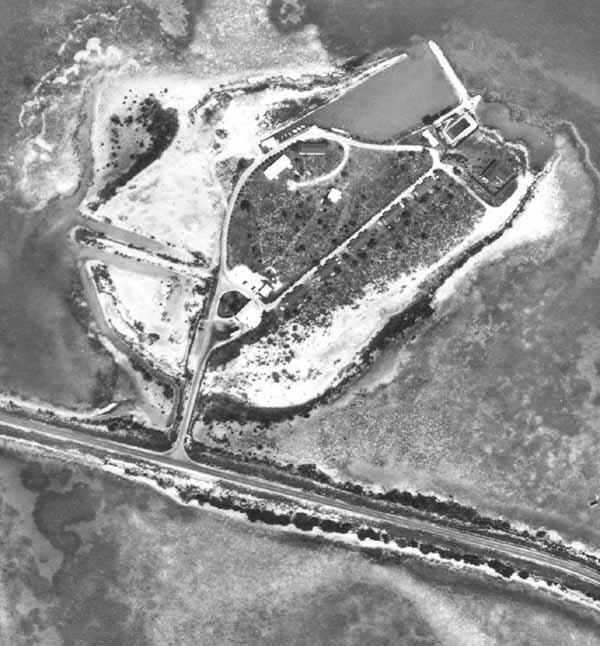 After the years of dredge and fill Fiesta Key extends on both sides of highway U.S. 1 at MM-70, that is 70 miles northeast ward from Key West. The latest chart has it too close to the gutter to copy well. The oldest nautical chart that I have is one of George Gauld made in the early 1770's that could have been made in preparation of the Revolutionary War or similar situation in the New Orleans' area. English surveyor Gauld made in 1773, 4 and 5 one of the best early sets of navigation charts ever made and an excerpt is shown to the right. Note that the name is hyphenated and the old English word "Kay" for island is used. Many are surprised that the name Jewfish which is debated for its political correctness was used that long ago and I do not know its origin. My personal opinion is that the name "Goliath Grouper" is not more appropriate. Gauld does not mention Jew-Fish Kay in his written sailing directions and watering places. He described Long Key (Cayo de las Bivoras, or Viper Key, or Rattle Snakes Key ) very well; "Kay Bivoras is 5 miles long, with a sandy beach and is remarkable for a high hammock of trees at the west end", but skips directly to "Old Matecumbe (Lower Matecumbe Key) the distance of 3 1/2 miles, is 4 miles long in the N.E. direction." Jew-Fish Kay is not mentioned, probably because of it served no purpose in those days. A separate note on the modern word "Key" used to identify an island. Its origin is not well established except by usage. Most believe that it began by the Spanish adapting the word "cayo' from the Taino Indians of Hispanola and Cuba referring to small islands. The Spanish normally used "isla" for island and "islet" for small island. At least in the New World, they appear to use "cayo" and "cayuelo" for a very small island. The English used "Kay" or "Cay" such as Cay Sal Banks. Cay is pronounced as the letter "K." Some English maps of the Keys made just prior to the Revolutionary War of 1776 used the word "Key." A Colonial American court record of the "Libel of Dennis and Allen vs the snow St. Fermin alias Britanis" in 1744 used the word "Keys" referring to the Florida Keys. See the Admiralty Papers, Vol. 2, 1743 - 1744. The next significant mention is in 1872 when Jewfish Key was surveyed by Charles F. Smith on November 20, 1872 for the State of Florida. Florida became a state in 1845 and the reference point for all land surveys is Tallahassee. It was in the 1870's when they finally got around to surveying the Florida Keys so that land could be specifically identified and legal land ownership could occur. In 1845 not all the land was given to Florida at statehood. Some of it was kept by the federal government and doled out for its purposes, for example "homesteads." 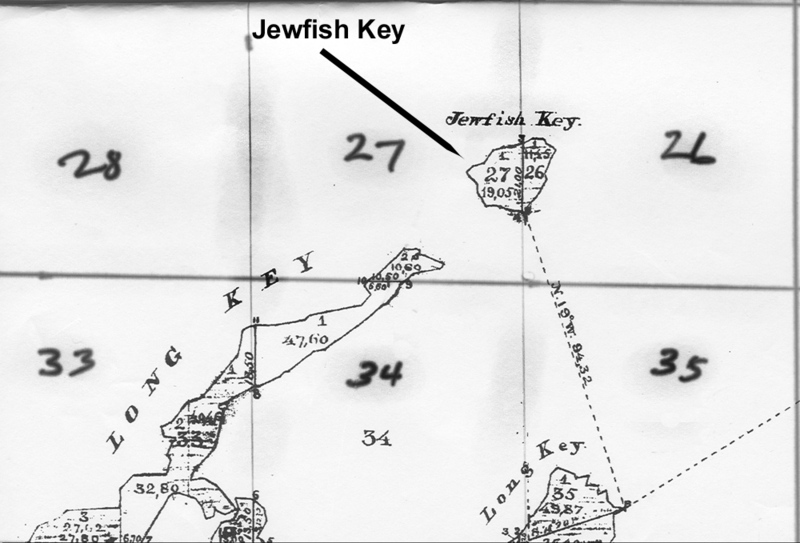 Below is a copy of Charles Smith's original 1873 survey map of Jewfish Key. Using the Florida survey system, Jewfish Key is in Township 45 South and Range 35 East. Each township is broken into 36 numbered one square mile sections. It just so happens that Jewfish Key straddles sections number 27 and 26, and was for description purposes further divided into two government lots, both labeled "Lot 1" which was all right as each lot had different section numbers. The US government had maintained ownership; therefore, the lots were available for homesteading. Louie Turner homesteaded both lots, the entire island, on January 7, 1908 becoming the first recorder owner. Henry Flagler built his Overseas Railroad, also known as the Homestead Extension, from 1905 to 1912 and the Overseas Highway was later built using the old Flagler right-of-way; therefore, the railroad was not built on Jewfish Key. But today, the highway passes over the southeastern part of Fiesta Key! Well, that is what dredge and filling can do - make land grow. Let's step back in time to Henry Flagler days. From mid 1902 to mid 1903 William J. Krome was hired by Henry Flagler to survey a possible route across the Everglades to Cape Sable. While his results were being evaluated, Krome completed surveying the Homestead Extension from Miami. The Cape Sable route was not favorable and Flagler's need for a deep-w ater seaport was urgent; therefore in early 1904 W.J. Krome was sent to survey a route across Card Sound, the top of Key Largo and out to a deep water location known as Turtle Harbor. On April 17, 1904 Krome received instructions to stop the Turtle Harbor work and preparere to survey to Key West. This he did and prepared a complete survey which was approved by James Meredith dated April 1905. To the right is the Jewfish Key area of the master locator sheet. It was never intended for the railroad to be on Jewfish Key. The railroad was completed passing by Jewfish Key and scheduled train service began at Knight's Key Dock in January 1908. This is about the same time that previously mentioned Louie Turner homesteaded Jewfish Key. I see no documentation in the FEC construction material referring to Jewfish Key. However, There is a void in Key West Extension railroad history of specifics for the Channel 2 and 5 bridge areas. We know in the beginning they were wooden trestle bridges, but some time after 1912 and before 1916, Krome came back and built the existing concrete arch viaduct bridges along side the wooden bridges without interrupting daily train service between Miami and Key West. All indications are that they use a work camp on the northeast tip of Long Key named "Rossmore." Rossmore remained a flag stop for a long time. 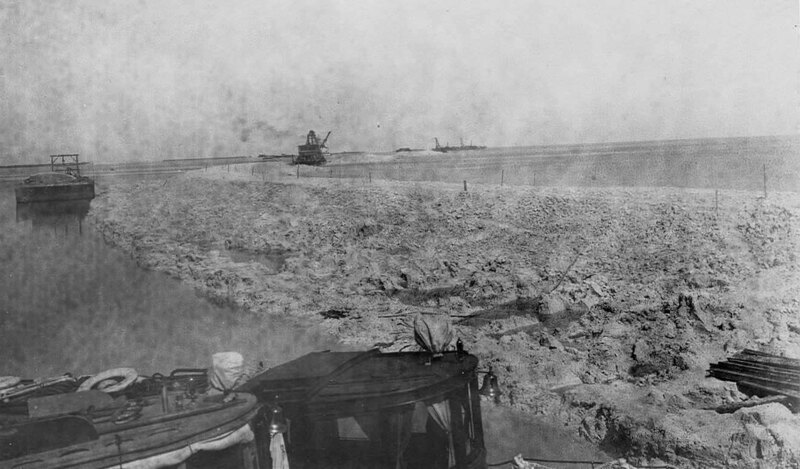 To the right is a September 1907 photo probably taken from Jewfish Bush Key looking northeast at work on the Channel 5 trestle. Remaining more or less chronologically, the next step would not immediately effect Jewfish Key. 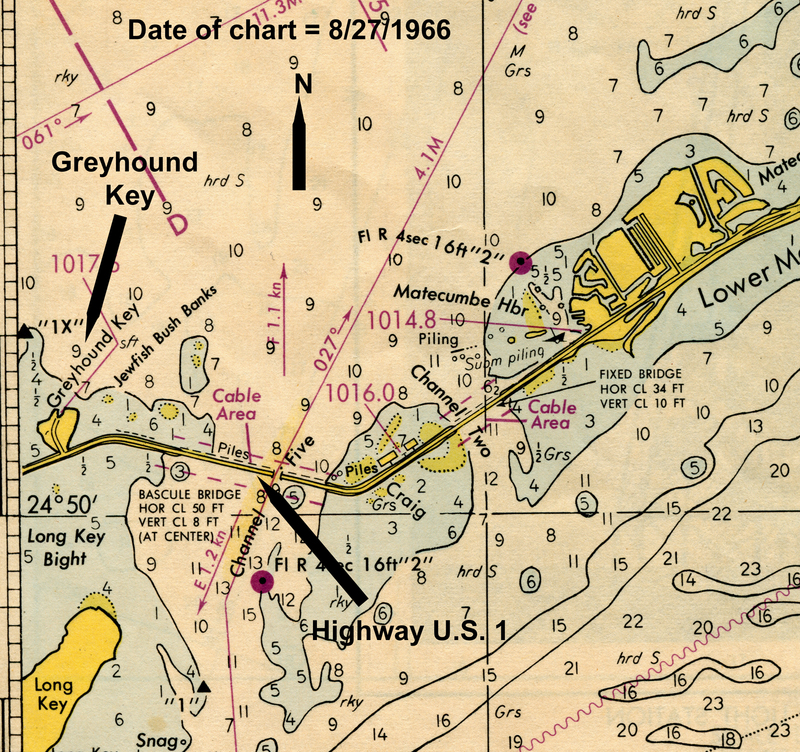 In 1925 Monroe County began 10 projects to construct a road from the county line at Card Sound to Key West; however, the portion between lower Lower Matecumbe Key and No Name Key would be served by ferryboats. This was completed from Homestead to Lower Matecumbe Key and No Name Key to Key West in January of 1928. 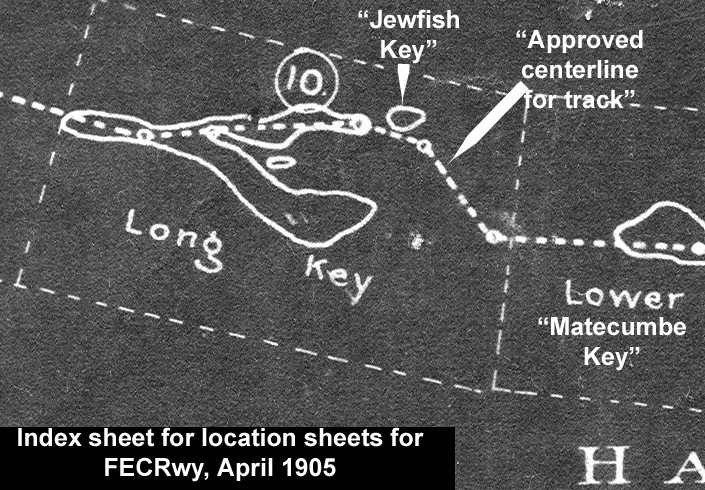 Jewfish Key was not effected; therefore, it remained relatively isolated other than trains passing by some yards away to the southeast and ferryboats passing to the northwest. The photo to the right is said to be a house built by a Mr. L.E. 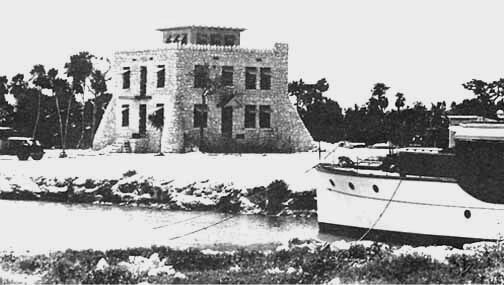 Goetz during the Florida Land Boom in the 1920's on Jewfish Key. I agree it certainly appears to be of the time period, but I wonder how they brought in the car which appears to be of very early vintage. Also note a dredged canal for the small yacht. Regardless, the house was later occupied by the Baker and Jinette families. The demise of the houce came when a propane tank for the laundry room exploded and fire gutted the house which had to be torn down. Roland Craig of Miami developed the wide portion of the FEC R-O-W a few miles north of Jewfish Key. He leased the sides of the rail bed right-of-way and built near or out over the water on both the ocean and bay sides in 1932. His camp was almost totally destroyed by the hurricane of 1935. As soon as the highway was built in 1938, Craig rebuilt the fish and yacht camp and continued to make improvement. He obtained a postal permit and became postmaster of Craig Key. On the northeast end of Channel 5 bridge was Craig Key and the southwest was Jewfish Creek. Until 1938 neither Key had any access other than the daily trains. They both provided their own utilities as there were none available until the 1940s. The Great Labor Day Hurricane of 1935 probably leveled Jewfish Key as the center of it passed over Flagler's Long Key Fishing Club a few miles to the south and Craig Key to the north. There were deaths reported as far south as Grassy Key, but I don't recall seeing Jewfish Key even mentioned. This brings to mind the Goetz house. According to all reports nothing between Grassy Key and Plantation Key survived other than portions of the Green Turtle Inn and the Leo Johnson house in Islamorada 14 miles farther northeast. About 40 miles of railroad was destroyed and the decision was to buy the FEC right-of-way (ROW) and road bed, albeit damaged, and convert it into a thoroughfare highway. Six days after the hurricane, it was decided to cremate the victims and a thorough and detailed map was made of all the cremation sites. 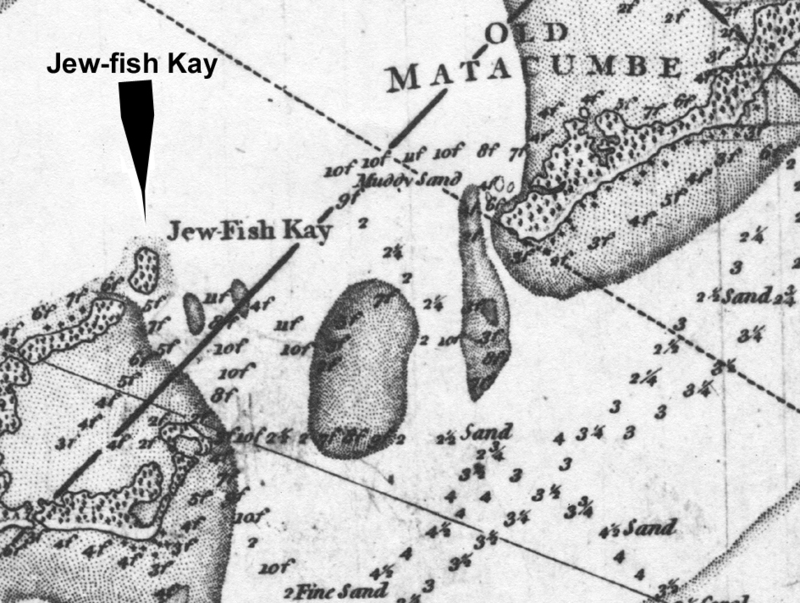 At the right is the Jewfish Key portion of the map. The northeastern portion of Long Key is shown at the lower left. I should mention that at some time in this period, Jewfish Key started being referred to as Jewfish Bush Key. The entire area on the bay side is known as Jewfish Banks or Jewfish Bush Banks. I first heard this name used talking with locals working with the WW-1 veterans building a road from the ferry landing directly to Jewfish 'Bush' Key. The intent was to build a road for vehicles to Key West to improve its tourist economy. The 1935 Hurricane destroyed all but 8 piers in the water and the approach way to the piers, now named Veterans Key. These remains can bee seen bayside at about MM 73 from the Channel 2 bridge. Monroe County organized a group with a state charter as the 'Overseas Road and Toll Bridge District' to build a road along side the FEC railroad. When the 1935 Hurricane destroyed 40 miles of railroad, the FEC decided not to rebuild the railroad and to sell the FEC right-of-way to the state did for $640,000. Bonds were sold guaranteed by future road tolls to do the conversion from rail bed to highway. Part of the revision work moved the roadbed very close to Jewfish Key, close enough so a simple bridge would allow access from the new highway, or they filled completely. It is a 200 foot ROW and it definitely appears to cross the southeastern tip of the island, but it did not. See the chart to the right. The Key West Citizen announced on March 28, 1938: "...Several Thousand Automobiles And 10,000 Visitors Expected To Arrive In Key West During Next Few Days..." Jewfish Key was now a viable piece of property with a major highway passing a few feet away, but the nation was still in the throes of the Great depression. The property remained the property of L.E. Goetz. The exact date is not known, but soon after WW-II began the island was purchased by Capt. William Phillip and Lena Baker of Miami. An interview with Mrs. Jo Anne Baker Essig, the granddaughter of Capt. Baker arranged by her son, Glen Essig, provided information of the next ownership. As a young lady of about 10 years old she related to traveling with her parents and grandparents to open up the coral rock house sometime in 1942. The house was covered with vines and had been vacant for a long time. See the house three photos above. Jo Anne had the original of this photo. She slept in the cupola on the third floor. At that time the first floor was not used for living. She would commute via bus on weekends and vacations from Miami to be with the grandparents and enjoy the outdoors. Her grandfather, Capt. Baker, tied his large fishing yacht (The 'Molly O') in the harbor where the yacht is shown above. He constructed a pole barn type structure near the house to keep the car and as a storage - work area. He named the island "Bakey" the 'Ba" being from his name Baker. The pronounce it as "Bay Key." It could have been just as well Baker's Key. He sold the island to the Greyhound Corporation about 1946. We are searching for more specifics. The postcard photo across from the title at the top-right of this page is thought to be of the late 1940s - it is not postmarked. This corresponds to the time Alonzo Cothron w as preparing the island for the Greyhound bus station and there appears to be the resemblance of a bridge or some kind of entrance from the highway. The postcard immediately to the right is some time later. The Florida Motor Lines had been operating in the Keys since the car ferry days (1928) - it did a relay service with busses in Key West and busses on Miami. 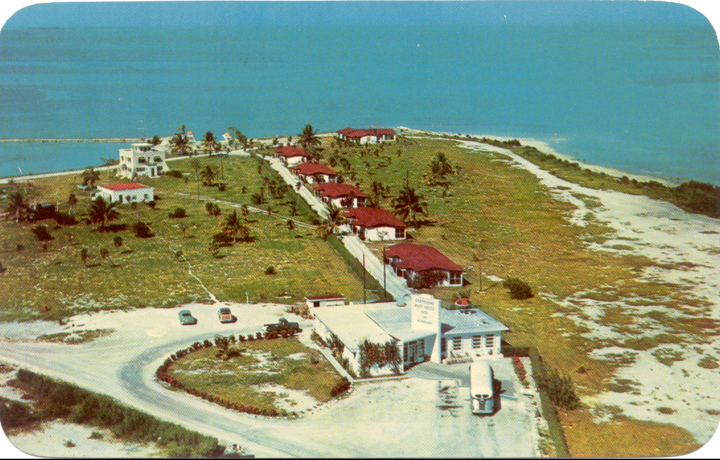 In the Keys, H. S. McKenzie had worked with the FML to have his sundry store in Tavernier perform as the rest-stop - MM-92. Soon after WW-II began, the former Tavernier postmaster, Everett Albury , told me while working at the Sundry Store he counted the FML busses that lined up for a rest stop. The most that he ever counted was 17! They were loaded with military personnel going to Key West for duty. Laurette Pinder Russell of Islamorada says the Jinette family used to have a son come in on the school bus that her sister drove. During WW-II the late Evanette Pinder Stone drove the Islamorada school bus to Jewfish Bush Key and bring children back or vice versa. There must have been a place to turn the bus around as she made the trip twice a day doing school season. One last photo, an aerial photo taken in 1958 to survey the electric power lines is to the right. 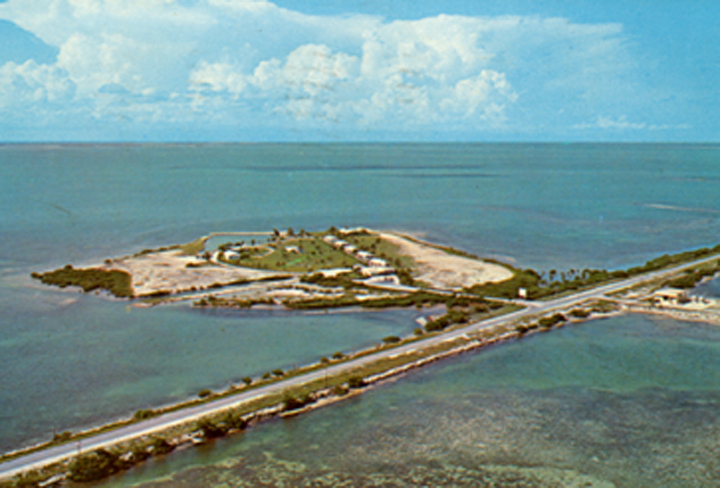 Kampgrounds of America (KOA) bought the island from the Greyhound Company in 1966 and gave the island a new name 'Fiesta Key' and it has operated very well surviving many hurricanes. As the wheels of so-called progress rolls over the sands-of-times , the Cortex Resort Living arm of the Cortex Companies bought the 28-acre island in 2006 to build 'high-end vacation homes.